Ok so first things first – how was your weekend? Do anything fun? Now that the weather here is starting to brighten up a touch I’ve been trying to take advantage of every opportunity to go outside and just soak up some vitamin D. It’s amazing what a little sunlight and fresh air can do for my mood. I just need to make sure I remember that when I’m feeling like a hermit and don’t want to leave the house. Yesterday I also took advantage of the partially sunny weather by trying my hand at making a stop motion video. I need more practice, for sure, but it was so much fun to make! I just need to figure out a way to control the light better. Ya girl’s struggling to keep up with those damn clouds. 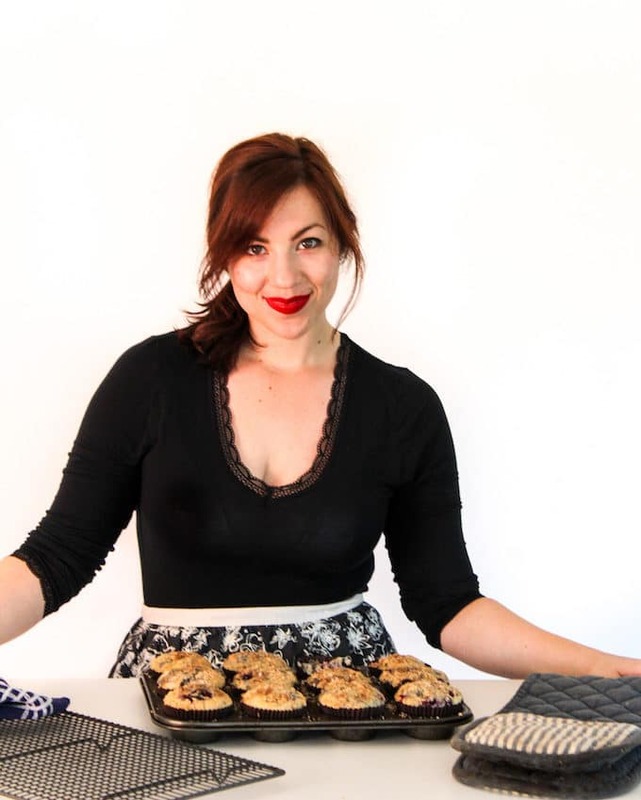 But anyway – onto the recipe! I’ve made this chicken for Mike soooo many times this week. While I usually don’t like making the same thing for dinner too often, I don’t mind making this because it’s just so easy. 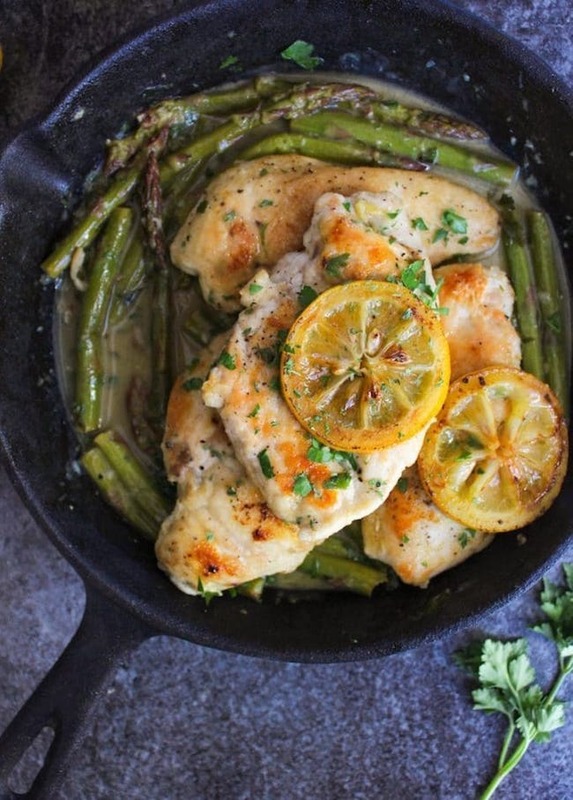 I know how much you guys like easy chicken dishes so I had to share another one but this time with lemon & asparagus as the main stars. It just feels so very much like a spring time dinner to me – it had to be done! The method here is simple enough: coat your chicken in light flour batter. You can use a regular gluten free flour or tapioca/arrowroot if you’re looking for a grain free, paleo option that’s also Whole30 compliant. After you brown the chicken on both sides, you quickly braise the asparagus in the pan along with a little garlic, stock, lemon juice and mustard. Once the sauce reduces down you simply add the chicken back to the pan, sprinkle with some parsley for added freshness and you’re done! All done in less than 30 minutes and in one pan. 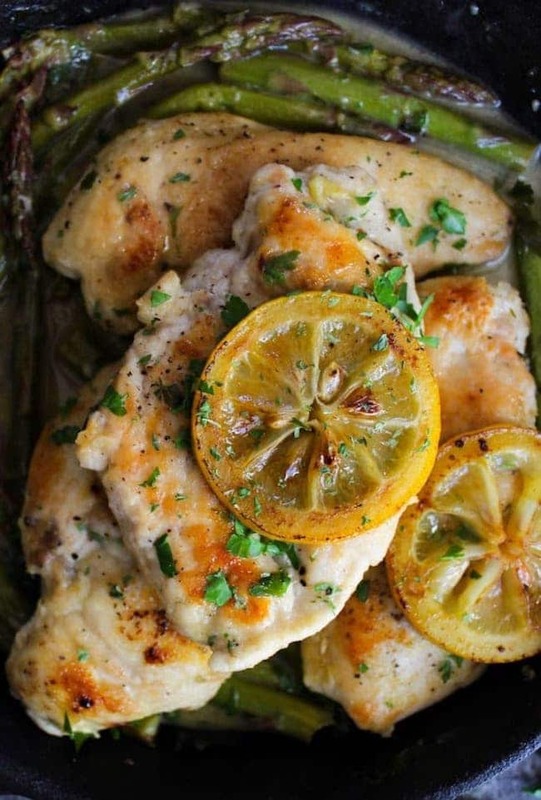 Serve the lemon chicken & asparagus over a bed of rice/cauliflower rice to soak up all the saucy goodness and enjoy! Bright and punchy lemon garlic flavours with a tangy, mustard bite – what’s not to love? And with minimal clean up too! 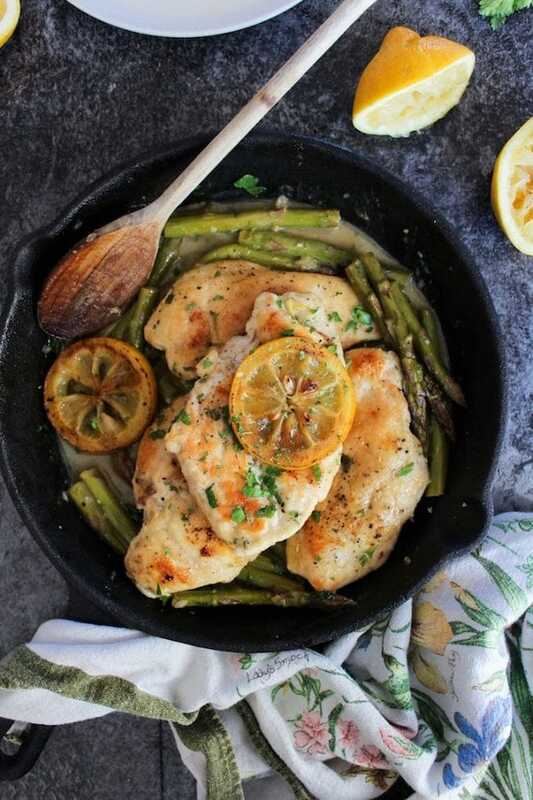 Don’t forget to #asaucykitchen on instagram if you try this One Pan Lemon Chicken! I love seeing what you make with! You can also post your pictures to our facebook page! Place the chicken breasts between two pieces of plastic cling wrap and pound them down to make them even in thickness. This will help the chicken cook evenly and make for more tender chicken. If your breasts are extra thick you can also just cut/slice them in half. Place the flour, salt & pepper in a shallow dish and gently toss the chicken breasts to coat in flour. In a large skillet add 1 tablespoon of olive oil and bring to a medium high heat. When the oil is hot add the chicken to the skillet and cook each side for about 5 minutes or until golden and cooked through. Once cooked remove the chicken and place on a paper towel lined plate. Set aside while you cook the asparagus. Add the remaining 1 tablespoon olive oil in the skillet. Add the asparagus stalks and sauté for a minute. Add the garlic and sauté another minute longer until fragrant. In a small bowl or cup whisk together the lemon juice and mustard until fully mixed. 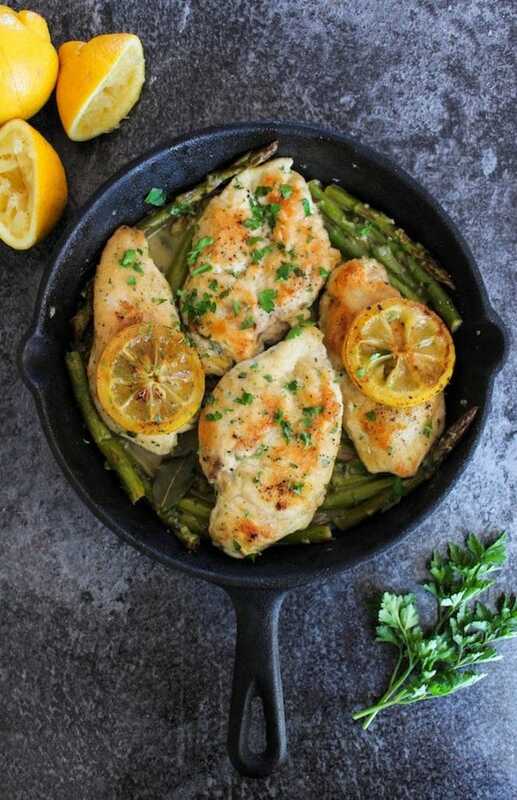 Pour into the skillet with the asparagus along with the chicken stock and the zest. Bring the liquid to a boil and then reduce down to a simmer. Cover and let cook another 3-4 minutes or until the asparagus is tender. Stir in the parsley and then add the chicken back to the pan and rotate the breasts to coat in the liquids. Taste the sauce and season with more salt & pepper as needed. How much longer do you leave the chicken on the last step? I just made this for dinner tonight and it was a hit! Easy, delicious and healthy. Thanks for sharing. I will be making this dish often! Thanks so much for coming back to let me know what you thought – thanks Jana! Hi I was hoping to serve with angel hair pasta, do you have a recommendation for say, doubling the sauce? Thanks! Hi Kristine! I’d recommend just adding an additional 1/2 cup chicken stock (so 1 1/2 cup altogether) to make more sauce and letting it reduce down a little longer than you normally would. I think doubling all of it might make too much and be a bit overwhelming for the pasta. Would you recommend replacing the oil with ghee if trying to go the whole30 route? You can do that if you like! Made this dish a couple of nights ago, it was yummy and super easy. My husband and my 5-year boy old loved it. The five year old said “the green stuff was good” –what a win! Ha! I love hearing that 🙂 So glad you guys enjoyed it! Thanks so much for letting me know what you thought! Tried this tonight and it is SO good!!! Family including 2 kids ages 4 and 2 and my big kid aka husband, LOVED it. I used potato starch as a substitute for flour and it makes the chicken so crisp and juicy. I also added a title ghee at the end. Placed over a cauliflower mash and boy oh boy was it delicious. I highly recommend this super simple, super delicious recipe! Great week night one. Easily a Whole 30/Paleo recipe. Could be Keto as well, I believe… Not as familiar with Keto… Thank you so much!! Ooh now you’ve got me thinking about cauliflower mash with ghee! *drool* So happy to hear you and your family enjoyed it! Thanks so much for coming back to let me know how it went! This looks so good! Planning to make this however, am more of a meal-prep person. Is this recipe ‘meal-prep able”? How long will i be able to keep it in the fridge? Hope to hear from you! Thanks. You should be able to keep these in the fridge for 3-4 days! Hope you like it! Really great recipe. Quick, easy, minimal clean-up and absolutely delicious. I didn’t have asparagus, so I used green beans. I served over the chicken and lemon sauce over farro. My family voted this recipe a ‘do again’. This is literally my new favorite recipe! Thanks!! Yay! So happy yo hear you enjoyed it! Thanks for taking the time to come back to leave a comment/review! I’m not clear how much lemon zest? 1/2 a lemon? 1/2 tsp? 1/2 tbs? Made it for dinner tonight. Only done with steamed asparagus instead. Chicken was so delicious and juicy that even my partner enjoyed it. Normally he wouldn’t eat chicken breast. Loved it and will be making it again. Thank you for the recepie. Yay! Glad you both like it! Thanks for leaving a review & comment! Just cooked this up for dinner and it was amazing! My boyfriend devoured it and is already requesting I cook it often. Thank you for a great, healthy dinner! Thia tastes so much like the lemon and herbs chicken from nandos but healthier! I love it! Am I missing something? When do you add the lemon zest? My mistake! You mix it into the sauce – I’ve put that in the recipe now where it belongs. Thanks for pointing that out to me! Wow, just cooked this and it is amazing! I didn’t have any Dijon mustard so substituted with wholegrqin, so I’m excited to try the full recipe! Can’t believe how tasty it was.